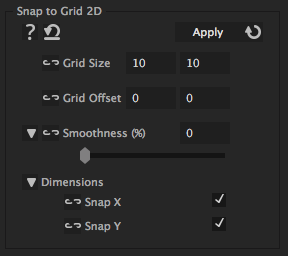 This iExpression is a variant of the "Snap to Grid"-iExpression that is intended especially for 2D properties and allows to control the grid size in x and y direction separately. Applied to the position of a 2D layer, it turns a smooth, keyframed motion into a motion that jumps from point to point on an imaginary grid. is the distance of the points in the grid (i.e. the width and height of each cell in the grid). moves the grid point by the specified amount (in x and y direction, respectively). determines how smooth the movement transitions from one grid point to the next one. allows to turn the effect on and off in x direction. allows to turn the effect on and off in y direction.